As always we’re huge fans of trying to find passive toys for our little ones to play with, especially since Beau tends to get bored at night while we’re sleeping and if we don’t keep him entertained… well he starts chewing on things. 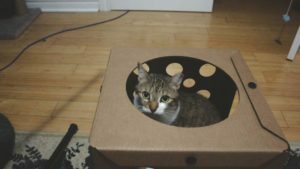 This time around we tried the Petstages Tower of Tracks Pet Toy which we’ve actually had since late last year when Beau first got his PU Surgery and Double Cystotomy. It has a good weight and doesn’t slide across the floor (although I’ve heard some other people have had issues with this, and it can easily be fixed by putting a weight/rock through the centre.) The model I have does have floor grips on it, so this may be the main reason it doesn’t slip, but I’m pretty sure older models had them as well. Trying to teach Beau to use this toy was actually pretty easy. All we had to do was push the balls a bit to get him to take his first swats. 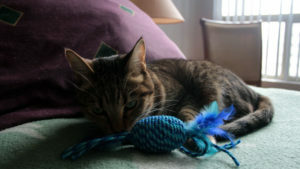 Actually, to get him interested in the toy (if we want to get him to play) we just tap on a ball and he goes for them! I’d say that’s a pretty successful toy, eh? To get your little one interested if tapping the ball doesn’t work, I’d recommend putting a treat inside or a piece of kibble. We’ve done this with Beau in the past, and when he knocks the ball he usually goes for it for longer play sessions. All in all, I’d give this toy a 5/5. It’s built pretty durable, it has some weight to it, it keeps my little one occupied, and has a much higher success rate than most other passive toys. 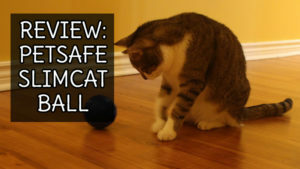 So pet parents, have you ever tried this toy before? If not, what other ones have you tried that are similar! I’d love to hear or try them out! **WARNING: Please make sure you get the version with the safety bar at the top. 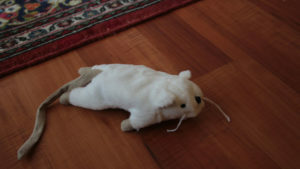 Older versions of this toy have the centre uncovered and curious kitties have gotten their little heads trapped in the toy causing some very severe emergency visits to the vet. Bwahahaha! Petcretary thought that safety bar was a handle for the peeps to carry it around, MOL, MOL! I think I might have enjoyed that when I was younger. Groucho the first kitty here loved to play with things on the unfurbros hot-wheel tracks….so I think he would have liked it. I wonder if there were a lot of changes from the first one (other than the safety bar). Beau is a bit chunky, about 12 pounds, and hasn’t had issues with its size or tipping it over or around. It could also have to do with the floors we have. I have one and it is fun if mommy gets it started for me. Glad you like it! And yeah, it seems that’s a good way to get them to play! We’ve never seen a track like that. We had one of those single circle ones, but we’re sorry to report it scared us and no one would touch it! Oh no! That’s no fun at all! Were you just not fans of the sounds? Or the size? We’ve seen this toy and it looks like fun. We may give it a try. That looks like a fun toy. Thank you for the warning about the safety bar. Hey no problem at all Ellen! Gotta make sure them kitties are safe! Oooh! I’ll have to check out those chew toys! 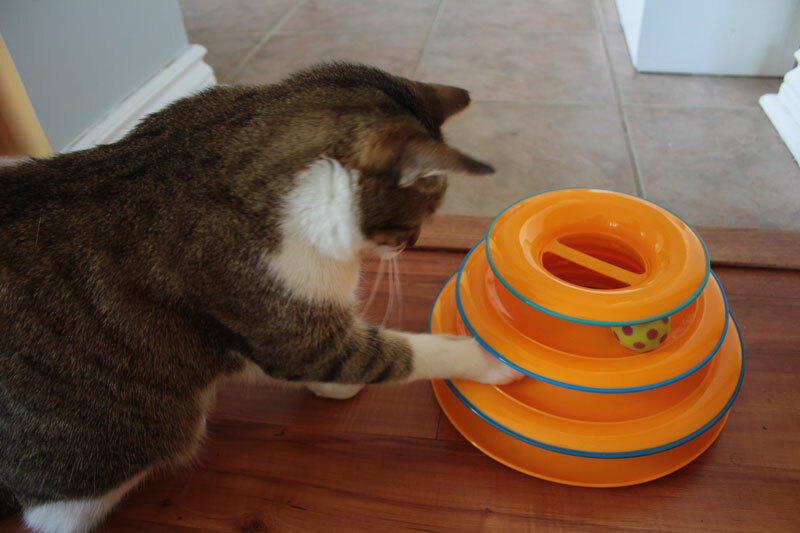 Love this cat toy idea. Even a safety bar at the top. Sounds like a fun toy for kitty. Thanks for the review.